Drake gets a lot of flack for cheering for seemingly every winning sports team in existence, but the internet jumped the gun on the Toronto-born rapper cursing the Los Angeles Rams. 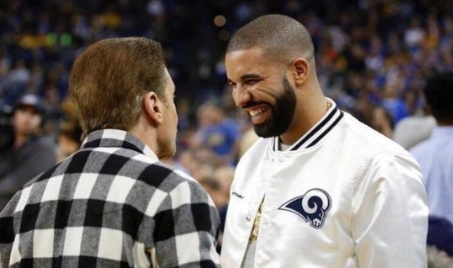 This photo of Drake in a Rams jacket popped up last night and was shared on Twitter after L.A. lost 13-3 on the big stage in the Super Bowl against the New England Patriots. The problem with the photo is it was Photoshopped. It’s easy to dunk on Drake since he’s a bandwagoner when it comes to winning sports teams. There’s also some evidence the teams he cheers for usually underperform on the big stage. It’s why he jokingly wore this sweater to avoid getting called out for cursing the Super Bowl loser. However, in this case, there was no Drake curse, as much as some people wanted to believe there was.